While quite nice as it is, there is always room for improvement. I've been thinking on features that I should/could add. Ability to use images from an RGBA Source for fonts. Including a .png library of some sort would help with that. 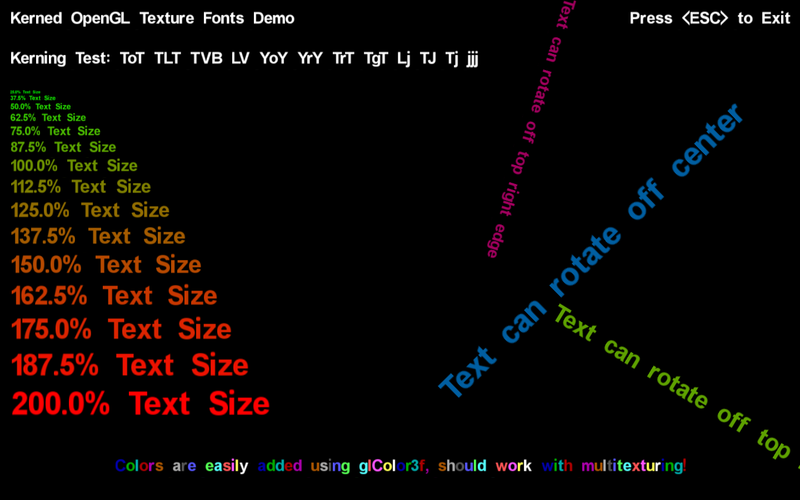 Auto-scanning routine to at least make the base .kerning file. It may still need to be hand tweaked before deployment. Have more scanning areas besides our current three, should a font warrant it, or to have LESS scanning areas for those cases where you are using a monospace or non-overlapping font. Include a development version of the library that supports loading the two separate .pcx and .kerning files. Possibly make the 'converter' part of the object. Support for a larger character set, hopefully the full byte range. I'd not try for anything fancier than that, though UTF-8 support would be kind-of cool. LZW or other encoding of the proprietary format's pixel buffer. Add a toggle to decide if mipmaps or a single image map is to be used - Possibly even include the ability to specify your own custom mipmaps. If you have any ideas that might help make this better, or comments/corrections/bugfixes/questions/flames, please feel free to fill out my Contact Form and let me know. Contents of DEATHSHADOW'S MADNESS © Jason M. Knight unless otherwise noted. All code presented on this site is released to the Public Domain. There'll be none of that open source licensing malarkey in here. If you going to give something away, LANDS SAKE JUST GIVE IT AWAY!! !